If you ever want to interact with veterans in any way, I highly recommend that you listen to Jay Knight’s podcast, Veteranology, for an unvarnished inside look into what it’s like for a young leader in the military to rejoin the civilian world. Most specifically, one of the best episodes to start with is Episode 5, with Army Veteran Russell Davies. This may be the closest that any family member, civilian, or previous era veteran is going to get to listening to a conversation between two young Infantry combat veterans, acronyms, the f-bomb and all. Jay and Russell are not too over the top with it, but it’s real and it’s accurate…and most importantly, if there is something that you find offensive in the podcast, then maybe it’s time to take a good look at yourself and what you bring to the table when working with veterans. As in my previous discussion about the movie ACRONYM, I don’t want to spoil the pleasure of hearing a great conversation between two combat veterans, but I thought that I’d provide some insight into some of the things they talk about from a mental health counselor’s perspective. The experiences that we, as Soldiers, go through [while in the] Armed Services…are drastic and have an impact, whether you want to recognize it or not. I feel like all of that shapes your life, some of it for the better, some of it for the worse. One of the things I enjoy about listening to this conversation is how aware these two veterans are about how their military experiences impacted them. Not every veteran who leaves the service has this level of self-awareness. Many don’t recognize what Davies talks about in this quote: their time in the service changed them. Another great point here is that the change was both positive and negative, reflecting the idea that a veteran’s time in the service was both the best time and the worst time in their life. Understanding this fact, either as a veteran, a member of the veteran’s support network, or as a member of the veteran’s community, can go a long way to helping the veteran make a transition to a more fulfilling post-military life. For veterans, it’s possible to talk openly about your experiences. 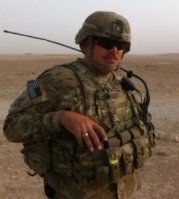 At one point in the podcast, Davies relates several incidents that happened in Afghanistan, one that resulted in him being awarded an Army Commendation Medal with a V device (for valor), and another that resulted in him receiving a Purple Heart. His ability to talk about these events without any outwards signs of distress is commendable, and shows to other veterans that it’s possible to get to a point where we can talk about things that happened in combat without breaking down or needing to take a shot of whisky. Knight, rightly so, recognizes Davies’ courage at being able to talk about these events while also understanding that he is not just telling a story, but also almost reliving these memories. “It’s always a struggle to kind of revisit those memories,” Davies says, “ultimately I feel like it’s a part of the story, and no matter what, whether or not you’d like to accept it or not, it’s a part of life, and you gotta learn from it and move on from it.” Having a safe place to do that, either with an understanding and non-judgmental family member or a mental health professional that understands the military, can help veterans get to the point where they are able to place the events in the proper perspective. This may be challenging for those who put together the various military branch’s transition assistance programs, but on a certain level, service members don’t care too much about what is going to happen when they are getting out. I recall the first job fair I attended, and I was surprised to see Soldiers walking around in tank tops and flip-flops. “Are they not taking this seriously?” I thought to myself. What I didn’t realize, however, is that my priorities were not the same as theirs…I had a mortgage, wife and two kids, something that I had to maintain upon transition, and I made the mistake of thinking that my experience was common. Many veterans leaving the service today don’t have the same mindset. Are there possibilities here? The opportunity to attend transition classes AFTER someone leaves the military, say six months or a year? Perhaps an opportunity for a veteran’s community to establish a similar program? If so, mental health and wellness should certainly be a part of it, and that part of the program should be delivered by military-informed mental health professionals. It got depressing, to an extent, you just start wondering, ‘what am I doing? What’s next?” You go from holding just such an honorable prestigious position of actually feeling like you’re contributing and making a difference to society to just kind of not knowing what the point of getting up the next day is. Beyond the challenges of PTSD and TBI that most of the public assumes are the biggest challenges veterans face, Knight and Davies do an excellent job of putting voices to and providing an explanation of how a lack of purpose and meaning in a veteran’s life can lead to post-military difficulties. This is where the mental health profession, with the theoretical basis in the work of Viktor Frankl, Irving Yalom, and Rollo May, can help veterans to come to understand why they feel ungrounded, and how they can change their thoughts and attitudes to be more in line with finding meaning and purpose in their lives. There is much, much more to this episode than the few points I’ve elaborated upon here. While each of these quotes are Davies’, Knight provides insightful reaction and comments of his own. Davies’ organization, Professional Transformation with Sports Development (PTSD) is both his attempt to provide relief to his brothers and sisters in arms, and his own post-military purpose. Knight’s podcast, Veteranology, has a simply stated mission: to help veterans leaving the service achieve healthy and fulfilling transitions in the civilian world. Similarly to Davies’ nonprofit, it is both a method of service to veterans as well as something fulfilling. These two young leaders provide a great example of how to continue serving in their post-military lives. Did you enjoy this post? Please comment below and share with your network in order to join the conversation regarding veteran mental health. You can sign up for updates from Head Space and Timing and follow him on Facebook, Twitter and LinkedIn. Keep the conversation about #veteranmentalhealth going. Duane, thank you so much for share Davies’ episode. It’s hard to pick a favorite but I know that leaving the interview with Russell I was incredibly motivated to get working on what came next. Now that I have time and Veteranology Season 2 is coming out, lets have a chat sometime! Jay, my pleasure. The episode was a good one among other good ones, but the reality of two infantrymen having an honest conversation is one that should be heard by many. Thanks!